Many children and teens do not get the recommended amount of sleep they need each night, and may also suffer from poor quality sleep. Research shows that media use and exposure can affect children’s quantity and quality of sleep which in turn can affect their physical and mental health. 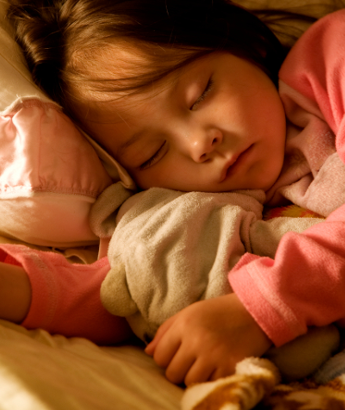 How can media affect children’s sleep? Using screens before bed can lead to later bedtimes and less time sleeping. The “blue light” from screens can throw off children and teens’ circadian rhythm, which is the body’s internal clock that helps us stay awake during the day and sleep at night. Notifications such as text and status alerts on a smartphone, whether audio or vibrations, can disrupt sleep and wake children and teens up during the night. This can lead to being overly tired throughout the day. Watching violent or scary media before bed can also cause children and teens to have less sleep and poorer quality of sleep. lead to sleep disruptions. Many teens experience FOMO or “fear of missing out” on a text or other alert from their friends. Address these concerns by reassuring them that the news will be the same in the morning and not something they should worry about at night. Additionally, recommend that they let their friends know that they go “off-line” at night. Keep TVs, computers and video game systems out of children’s bedrooms, and make sure that all other internet connected devices such as tablets and smartphones are left in a common room or your bedroom to charge overnight. By keeping these electronics in a common area, parents can monitor their use much more easily and help limit children’s exposure to blue light and sleep disruptions. Parents should model for their children the behaviors they would like to encourage. Leave your phone in the designated charging area at night too, and do your best to follow a healthy, media-free bedtime routine.